Below the Surface by Tim Shoemaker. A Code of Silence Novel. Review: You can bury fear, but that doesn't mean its dead. That's what Cooper, Hiro, Gordy, and Lunk find out on one long summer vacation. 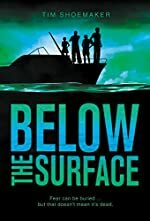 Below the Surface is a heart-pounding mystery that leaves you wanting way more than a simple ending. It is the 3rd book in the Code of Silence series written by Tim Shoemaker. When these four friends who have already been witnesses to robberies and been kidnapped go on a vacation to relax, everything goes wrong. On the first day, the friends witness a murder and Hiro, a cop's daughter, goes right into action to prove who did it. Although her friends don't believe her and there is hardly any evidence, she is noticed by the killer and pulls her friends into danger. A car hits Cooper, and the friends are being stalked, but that's only the beginning. As the clues come together, someone is ready to make the situation even worse, with plans to kill Hiro. What happens to Hiro and her friends? You will have to find out! I loved this book! It has everything - murder, mystery, and reality. The book shifts back and forth from the perspective one friend, or foe to another, every two or three chapters. Although the suspense is amazing, there are a few flaws. Although Below the Surface seems to drag on, there isn't much action until the end and the readers are left hanging, this still an amazing book. All in all, this book is great for teens and young adults ages 10 and up. The violence and suspense may be too much for some younger children. The book is enjoyable for both girls and boys, and the action and suspense will draw in any reader itching to solve a mystery. I highly recommend this book and hope you enjoy it! We would like to thank Zonderkidz for providing a copy of Below the Surface for this review. Have you read Below the Surface? How would you rate it?